A gentle blend of natural moisturizing ingredients and mineral sunscreens, with the added benefit of insect repelling essential oils. Please note that this products have not been evaluated by Health Canada and therefore cannot be assigned an SPF rating. The percentage of zinc oxide combined with the natural UV filters of the base ingredients can give protection comparable to SPF 30. However all skin is different and can tolerate different amounts of sun. When using my sun cream please be vigilant in reapplying regularly, especially after being in the water or sweating. The best protection from the sun is wearing long sleeves, a hat and sitting in the shade. These formulations have been tested on adult and child volunteers for a few summers with great success, I’m confident you will love them too. I absolutely love this product!. It smells so good and it absorbs into the skin leaving your face soft. There is no white residue like most zinc products. It is also suitable for sensitive skin as most sunscreens give me a rash. I highly recommend! I love this product. It lasts a long time and is very skin loving. SMELLS DIVINE. Sometimes I open up the tin to just smell it haha. I use this on my face (along with a hat) as I can suffer from hyper-pigmentation and this really protects my skin. I have yet to get a burn while using it, but I am careful to reapply as suggested. I’ve been looking for a sunscreen/bug repellent “natural” product for a long time. I’m an avid hiker and the sun, along with biting flies and mosquitos, can be relentless. I’ve had the opportunity to review this product in the backcountry a few times already this year and am very pleased. It goes on similar to the moisturizers, so unlike traditional sunscreens, it doesn’t have to be slathered on – a little goes a long way! 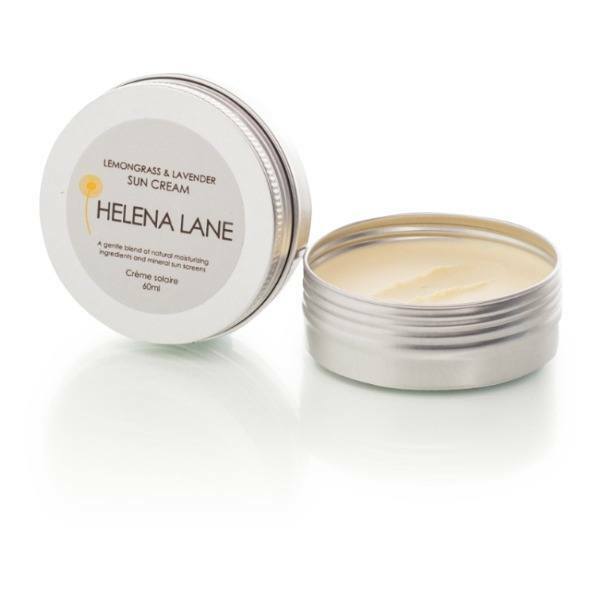 Just make sure to reapply when you get to top of the world or the end of the road….happy trails and thank you Helena!! Most amazing product I have ever used. Love this product, I must say I prefer the lavender and chamomile sent more, but these products are the best! Goes on so smooth and the protection that it provides is awesome, also it works as a moisturizer. Keep up the great work Helena Lane. Apply generously and regularly prior to sun exposure and repeat after contact with water. As all skin reacts differently in the sun I recommend reapplying every 40 minutes when first using this sun cream, you can then adjust the timing depending on your skin.